Compilation of new and previously released tracks. Subtitled "Bourbonese Qualk 1982 - 1990"
Track A1: previously unreleased, recorded 1986. Track A4: previously unreleased, recorded 1985. Track A6: previously unreleased, recorded 1987. Track A7: to be released on the new LP "Unpop" [New International Recordings, NIR 905.] Recorded 1990. Track B4: live recording "Intergalaktisches Laermstruktur Festival" Ravensburg, West Germany 8.5.87. "This album was mostly a solo project of simon crab with the aid of Cristoph Fringeli of Praxis records, recorded after a 2 month tour in the USA and Europe. Typically for Bourbonese Qualk, this album delivers the opposite to the listeners expectations, breaking the mold set by ‘My Government Is My Soul‘ and ‘Unpop‘ – ‘Autonomia’ sets out in the completely different direction. the direction of harsh electronic ‘no compromise techno’. this album divided Qualk’s ‘fan base’, created violent debate and polarised press reviews." Tracks 12 - 14 are not mentioned on the cd tracklisting. Limited edition of 100 hand-numbered copies. No track titles or sides are indicated. Recorded live at the dom moscow.21.10.00. Limited edition of 300 copies, 160-gr. black vinyl, with postcard. 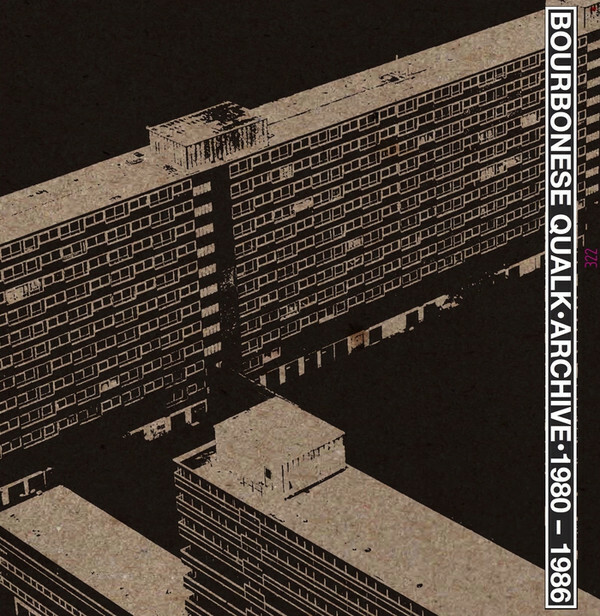 Simon Crab of Bourbonese Qualk compiled 80 of his favorite BQ-Tracks for this 4Lp-Set which he has written and composed. The selection ranges from the early, more industrialish and experimental period of the first ultra-limited Tapes from 1980/81 such as „Us“, „Cast Loose Red Net“ or „Half Erased“ to more beat-orientated compilation-contributions of the mid 80’s as most of the fans and listeners are familiar with. The Box also provides 20 previously unearthed and unreleased tracks of same period 1980-86. Also part of this Box are almost all compilation-contributions of the early to mid 80’s Tape-Releases in which BQ participated. If there was ever a missing gap in the history of BQ, then this Box will be the ultimate buy to close the gap.